Dell has been identifying new ways to support the education community on the web. One of their developments is a Wordpress plugin called Education Connect that will help connect education blogs to each other. With the help of some of the top education blogs in the industry they have come up with a great tool to link bloggers to each other. Let me first explain how it works. 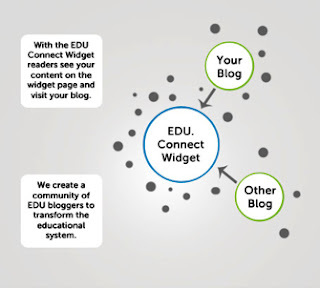 Education Connect is a widget/plugin that helps connect education blogs around the World. 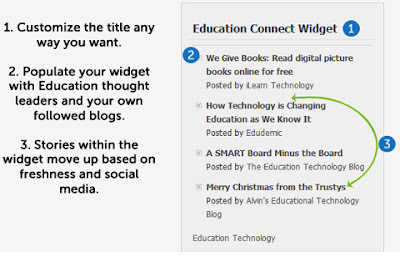 The widget is a content aggregator that takes articles from the highest quality EDU blogs and presents the titles within the widget. The widget has a special crawler that goes to a pre-set list of education blogs that are selected based on content quality. It then takes the title of the latest articles written by that blog and populates the widget sitting on the installer’s website. Articles within the widget are then ranked based on a variety of social media factors to present only the best, freshest articles. Special crawler goes to a pre-set list of education blogs that are selected based on content quality. Crawler takes the article titles back to the widget installer’s webpage. Drops the article titles in the widget or installer’s web browsers to discover new educational material. Create an educational community that is connecting and innovating the EDU World. Ability to select which blogs you want to pull articles from. The goal of the EDU connect widget is to help users and publishers discover new content and better connect with the EDU community. With the widget you can discover articles about educational technology, education news, education lessons, and more. So what are you waiting for? Help connect the EDU World and install this Wordpress plugin. Visit any of the following links to get started. The following is a guest post by Doreen Zacher, New Milford High School's Student Assistance Counselor. 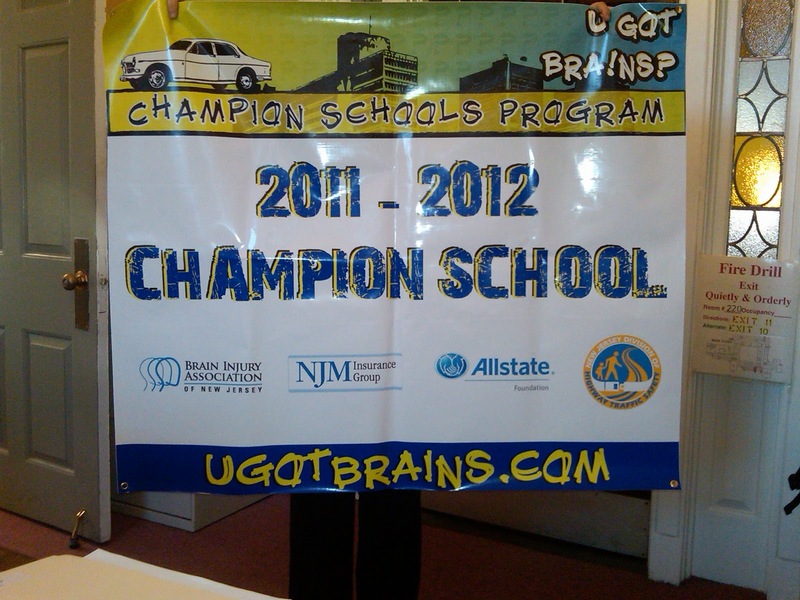 She recently collaborated with graphics teacher Walt Pevny and NMHS students in the U Got Brains Challenge 2nd Annual Champion Schools Program. Their efforts resulted in NMHS being selected as a champion school in the battle to stop students from texting while driving. NMHS is now competing against other champion schools for a driving simulator. Distracted operation of a vehicle occurs when the driver is engaged in non-driving activities, which hinder their overall ability to operate the automobile in a safe manner. While all distractions can endanger the overall safety and well being of occupants, texting and the use of cell phones are by far more prevalent. 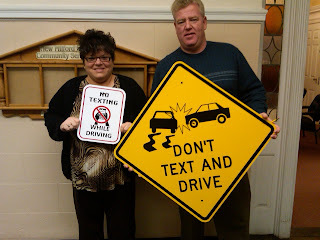 “Twenty percent of injury crashes in 2009 involved reports of distracted driving. Of those killed in distracted-driving-related crashes, 995 involved reports of a cell phone as a distraction (18% of fatalities in distraction-related crashes)” -NHTSA. New Milford High School wants to assure that our students arrive safely at their destinations and do not make a fatal decision to use cell phones while behind the wheel. New Milford High School was an active member in the 9th Annual “Get It Together” Challenge. 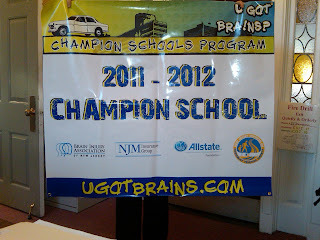 The “Get It Together” challenge was a local competition between high schools designed to increase seat belt usage. The faculty and administration championed this competition to assure the safety of all New Milford students, families, and community members. There were two unannounced checks for seat belt compliance. The first was September 28th, 2011 and the second was October 6th, 2011. To continue our dedication to the overall safety and well being of our students, and community members, Mr. Walt Pevny developed the “Safe Box” which was entered into the “U Got Brains Competition”, sponsored by the Brain Injury Association of New Jersey. This revolutionary device helps to promote “text free” driving among teens. Upon entering into the automobile, the students place their cell phones into the “Drive Safe Box”, the phone will be automatically charged and the student will not be able to remove the phone. The driver will be unable to text or use the phone with hands; however they can still utilize and enable their blue tooth systems. The “Drive Safe Box” can only be opened from the rear with a key, which has been attached to their car key ring. Mr. Pevy’s multimedia class is developing a “Public Service” video on the dangers of texting while driving (to be included with every product sold). Also, his Advanced Desktop Publishing class will develop a “marketing campaign” for the product (ads, brochures, website, etc.) The prototype will be manufactured by Dr. Asa Awuku and his engineering club. New Milford High School has received notification that the “Drive Safe Box” was selected as one of the top ideas and was awarded the $1,000 stipend to develop our product. Besides the initiatives listed above NMHS has joined a campaign sponsored by My Parking Sign and received two FREE signs seen below (pictured are Doreen Zacher and Walt Pevny). These signs will be placed on two areas of our campus where they will be clearly visible to our student drivers. The following is a guest post by Wendy Mackey, one of my Special Education (English) teachers at New Milford High School. The problem with Web 2.0 is that it takes time to understand! 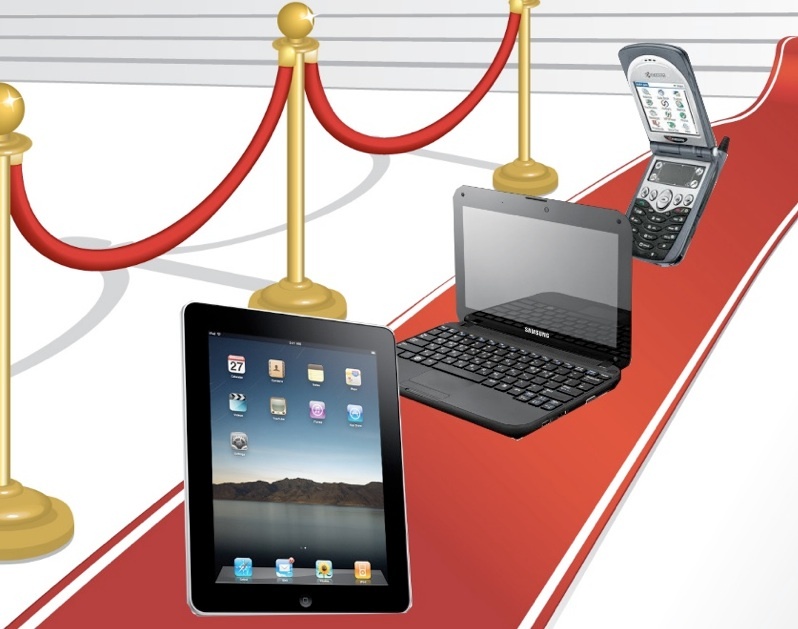 There are so many great technology programs out there to choose from, that it can be very overwhelming for us teachers to narrow down exactly what to use. I, however, feel like I hit the nail on the head with Glogster. My students just finished reading an alternative novel by MT Anderson called FEED. There were many themes that the story dealt with, but one that I found the kids most were interested in was the fact that a teenage girl was dying, and she was making a list of the things that she still wanted to do while she was alive. This chapter prompted a class discussion, and I explained to the students what a “Bucket List” was. They all discussed their ideas of what they wanted to do during their lifetime, and I knew that this was my opportunity to create a meaningful project for them. Glogster, an online poster website, was the perfect forum for my students to create their Bucket Lists on. As a teacher, I took a week or so and created my own poster, simply so I could show the students how to navigate around the website. I was able to set up a free (for 30 days) teacher’s account, and I added my students on my page. They were all given nicknames and passwords, and I had the control to see what they were working on every step of the way. Once I presented my Glog, and showed them all of the fun options that were available, they were off and running. I wasn’t surprised to see that they picked up on it immediately. (And I’m slightly embarrassed to say that they even showed me some features that I had missed!) We spent two class days working on brainstorming ideas and finding graphics to portray them. I then allowed the students one extra week to work on their Glogs from home. During my personal trial run, I recognized that once this concept was in my brain, I kept coming up with new ideas each day and wanted to add them to my Glog, so I gave the kids the same opportunity that I had - the gift of time. I am proud to say that all of my students did very well with their Glogster Bucket Lists. Many of the students had ideas that made me laugh out loud, while other students gave me a deeper understanding of who they were through their posters. Below you will find links to view some of the Glogs that my students created. All in all, I am extremely pleased with this authentic and meaningful project. What am I going to do with this later in life? How is this going to help me get a job? This can sometimes prove to be a difficult task as real world contexts are either not established or properly articulated. One effective strategy is to leverage local resources by bringing in experts as guest instructors. Not only is this cost effective, but students can hear from actual practitioners in the field whose experiences connect to what they are currently learning about. They can also provide concrete connections between different content areas. This is a fantastic way for students to acquire additional essential understandings of concepts and how they connect to specific lines of work. It is one thing for students to learn concepts, but another to see how they are actually applied in a professional line of work. Guest instructors serve as a great resource to answer the common questions listed above. All of these reasons listed above are sure to increase engagement and instill a greater sense of relevancy and meaning amongst learners. On December 13, 2011, Art Coughlin from Nelson-Patterson Insurance Agency in New Milford was a guest speaker in Mrs. Vicari’s Business Strategy classes. Mr. Coughlin spoke to the students about the Insurance Industry, types of business insurance, as well as, what it takes to be a successful entrepreneur. Additionally, Mr. Coughlin has graciously volunteered to give the students “mock” insurance quotes for their start-up businesses. The students have to research the costs associated with starting a business and are then to ask for a loan as part of a business plan competition. On December 15, 2011, Mr. Tusa of the Social Studies Department guest lectured on the history of racism in America in Mrs. DePoto’s AP Language and Composition class. The AP class is studying nonfiction works on a variety of themes this year; Mr. Tusa volunteered to bring a historical perspective to a piece the class was studying by Thomas Jefferson called “Notes from Virginia”. The class was able to trace the history of philosophical movements that impacted some of the earliest writers of our nation and are to see the connection between their ideas and various contemporary figures such as Martin Luther King and Malcolm X. Future collaboration between the Social Studies Department and the Language Arts Department is planned. Mr. Thomas Jaworski, an alumnus of New Milford and a professional engineer visited the high school and delivered a presentation on civil engineering on Friday, December 16. His presentation to the engineering class covered many of the fields of civil engineering. He discussed bridge construction in detail, citing local and familiar examples including the George Washington and Tappan Zee bridges. The engineering students responded very well to the presentation and continued the discussion well after the class had ended. Mr. Jaworski offered to assist Dr. Asa-Awuku and Mrs. Bergoffen with developing an activity for “Engineering Week” in February of 2012. New Milford High School is obviously a place where students feel safe and comfortable while they are here as our students. This can be seen each year as former students come back to visit, work as substitutes, and in some cases even get hired as teachers. For two days this December, in Mrs. Collentine’s Global Perspectives in Literature Honors classes, NMHS class of 2005 alumnus Jonathan Silver was a “guest” speaker/teacher/actor and taught and performed Shakespeare’s Hamlet for Mrs. Collentine’s students. Jon, who is currently serving as producer and director of this year’s NMHS spring musical, is a professional actor. A graduate of the University of Cincinnati with a degree in Dramatic Performance, Jon was thrilled to teach for two days when Mrs. Collentine asked if he would come into her classes. Jon spent a summer in London studying Shakespeare and even performed on the famous and historical Royal Academy of Dramatic Arts stage. He is a natural and a force to be reckoned with as he brought a palpable passion to Mrs. Collentine’s classes. He discussed why Shakespeare is so challenging for young adults, he gave them techniques in terms of approaching the text, and he logically compared the analysis and reading of Shakespeare to math problems like calculus and trigonometry. His booming voice took on the roles of Hamlet, the Ghost and King Claudius. The kids read with him and he joked and laughed with them as he compared Hamlet’s world to the world of today’s teenager: Britney Spears was mentioned and the word “emo” was as well, along with other 21st century references. As hard as English teachers work to bring any text to life and off the page, there is always a welcome burst of energy when a professional actor comes to town. Visiting artist Clifford Smith, a New Milford High School Alumnus, came to share his paintings with students in Ms. Bettini’s class. Smith’s artwork is in exhibits at the Spanierman Galley (NYC), Fashion in the Hamptons (NY), Scott White Contemporary Art Gallery, the Travis Hansson Fine Art Gallery (CA), the Rosenbaum Contemporary Gallery and the Elaine Baker Gallery (NJ). He is known for his paintings of oceans, fields, landscapes, and portraits. Technology can also greatly assist educators in bringing in a variety of experts from all over the world in virtually every field. Some fantastic free video conferencing tools include Skype and hangouts within Google+. Establish your own unique real world learning experiences within the walls of your school today! To see other guest instructors that have visited NMHS check out the archive of my monthly Principal's Report. 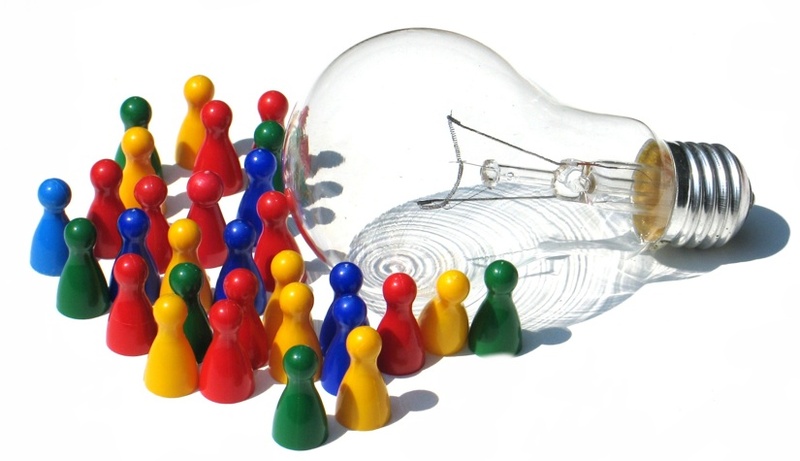 I am a firm believer that creativity fuels innovation. The problem though is the the majority of schools all over the world work as hard as they can to get learners to conform to a curriculum and standards while preparing them to perform at a level on standardized tests. This is as uncreative as it gets. In the age of misguided reform the challenge becomes transforming institutions of learning and steering away from irrelevant pedagogical techniques in a way that not only meets the needs of society, but most importantly that of our students. At New Milford we have taken a big step in placing creativity at the forefront with the creation of our Academies at NMHS as well as the introduction of new courses such as Digital Journalism, Digital Photography, Business Practice Firm, Engineering, and Biotechnology. Teachers are also beginning to embrace a variety of Web 2.0 tools and integrate them in a way that allow students to unleash their creativity (see this Glogster example). The PLC I am a part of with the rest of my administrative team focuses on a classroom walk-through process targeting student-centered instruction. This is a small snapshot of what we are doing to promote creativity. I am hoping the video above can become a catalyst for a more detailed discussion on the following: How can we nurture creativity in educational contexts? What has to be done to transform schools in a way that embraces creative instructional strategies and thought amongst learners?